From left: Mike Herrera, Steve Napolitano, Al Muratsuchi, and Lou Baglietto at the Elks Lodge on Thursday night. REDONDO BEACH — Assemblymember Al Muratsuchi (D-Torrance) was awarded the Legislator of the Year Award by the Boys and Girls Club of the South Bay at their annual Keystone Dinner on Oct. 24 for his efforts to save the club from financial ruin. Muratsuchi introduced Assembly Bill 835 this year after the Boys and Girls Club Executive Director Mike Herrera informed him of the financial distress facing the club. According to Herrera, the club had an outstanding loan debt whose terms could not be renegotiated. The Department of Housing and Community Development (HCD) believed it did not have authority to renegotiate the terms of the loan that was issued by the Child Care Facilities Financing Program (CCFFP) and administered by the now defunct Technology, Trade and Commerce Agency. AB 835 would have given the HCD the authority to modify loans made under the CCFFP, and ultimately save the Boys and Girls Club of the South Bay. 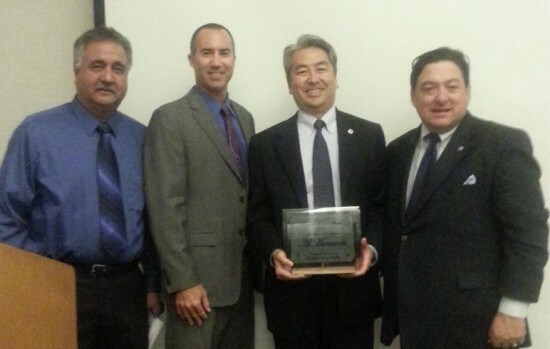 Muratsuchi held AB 835 in the Senate Appropriations Committee at HCD’s request. The legislation brought the issue to the attention of the HCD director, and soon after the agency’s chief legal counsel determined that they did indeed have the authority to modify loans made under the CCFFP.